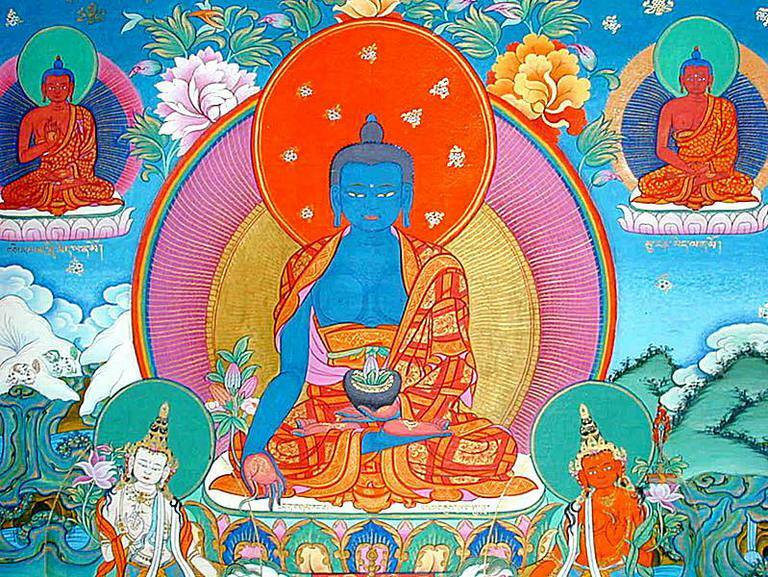 Bhaiṣajyaguru is the Medicine Buddha or Medicine King. He is venerated in much of Mahayana Buddhism because of his powers of healing, both physical and spiritual. He is said to reign over a pure land called Vaiduryanirbhasa. The earliest mention of Bhaiṣajyaguru is found in a Mahayana text called the Bhaiṣajyaguruvaiḍuryaprabharaja Sutra, or more commonly the Medicine Buddha Sutra. Sanskrit manuscripts of this sutra dating no later than the 7th century have been found at Bamiyan, Afghanistan and Gilgit, Pakistan, both of which were once part of the Buddhist kingdom of Gandhara. He vowed that his body would shine with dazzling light and illuminate countless worlds. His radiant, pure body would bring those dwelling in darkness into light. He would provide sentient beings with their material needs. He would guide those walking on deviant paths to find the way of the Great Vehicle (Mahayana). He would enable countless beings to keep the Precepts. He would heal physical afflictions so that all beings could be able-bodied. He would cause those who are sick and without a family to have healing and a family to care for them. He would cause women who are unhappy being women to become men. He would liberate beings from the nets of demons and the bonds of "exterior" sects. He would cause those who are imprisoned and under threat of execution to be liberated from worry and suffering. He would cause those who are poor, without clothes, and plagued by cold, heat and stinging insects to have fine garments and enjoyable surroundings. According to the sutra, the Buddha declared that Bhaiṣajyaguru would indeed have great healing power. Devotion to Bhaiṣajyaguru on behalf of those afficted with sickness has been especially popular in Tibet, China and Japan for centuries. The Medicine Buddha is associated with the semi-precious stone lapis lazuli. Lapis is an intensely deep blue stone that often contains gold-colored flecks of pyrite, creating an impression of the first faint stars in a darkening evening sky. It is mined mostly in what is now Afghanistan, and in ancient eastern Asia it was very rare and highly prized. Throughout the ancient world lapis was thought to have mystical power. In eastern Asia it was thought to have healing power as well, especially to reduce inflammation or internal bleeding. In Vajrayana Buddhism, the deep blue color of lapis is thought to have a purifying and strengthening effect on those who visualize it. In Buddhist iconography, the color lapis is nearly always incorporated into the image of Bhaisajyaguru. Sometimes Bhaisajyaguru himself is lapis,or he may be a gold color but surrounded by lapis. He nearly always holds a lapis alms bowl or medicine jar, usually in his left hand, which is resting palm up in his lap. In Tibetan images, a myrobalan plant may be growing from the bowl. The myrobalan is a tree that bears a plum-like fruit thought to have medicinal properties. Most of the time you will see Bhaisajyaguru.sitting on a lotus throne, with his right hand reaching down, palm out. This gesture signifies he is ready to answer prayers or give blessings. This could be translated, “Homage to the Medicine Buddha, The Master of Healing, radiant like lapis lazuli, like a king. The one thus-come, the worthy one, The fully and perfectly awakened one, hail to the healing, the healing, the healer. So be it." Sometimes this chant is shorted to "Tadyatha Om bhaisajye bhaisajye bhaisajya samudgate Svaha."